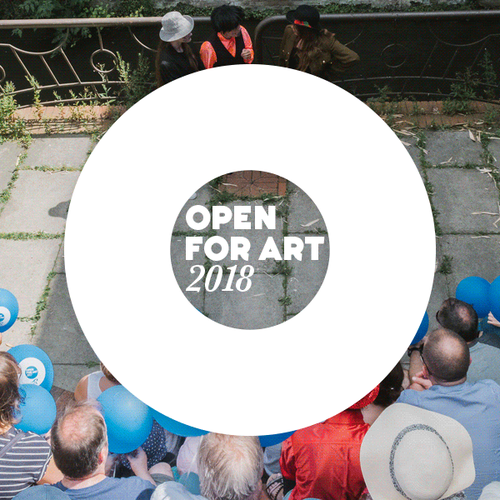 Open for Art – Reading’s town centre arts Festival, curated by Jelly, celebrates its fifth year running this summer and, making the celebrations even more special is the fact that it is Jelly’s 25th anniversary this year too! The event takes place from 2nd – 8th July and this silver jubilee year is set to shimmer, with lots of artistic activity for everyone to enjoy! New this year, is the introduction of 25 stories, which gives those close to Jelly the chance to tell their tale; everyone from new students to original founders, revelling in all forms of art and design. 2018 also sees the launch of ArtLine on Sunday 8 July, a new visual-arts street market on Broad Street. Presented by Reading Business Improvement District, in partnership with Jelly’s Open for Art festival, ArtLine aims to attract people to Reading and support the town centre economy while profiling Reading as a cultural destination supporting a strong artistic community. Taking inspiration from Reading’s famous Bayeux Tapestry, visitors can join artist Kate Powell who will be creating an embroidered panel, starting at Open for Art and growing over the year, culminating in time for Jelly’s birthday in December. You can also join the Creative Book Club at Milk with an exclusive cocktail on offer, visit a static fashion show with work from Reading College students at the White Building, immerse yourself in an exhibition of works by Jelly artists, curated by Squirrel Ink, where each artist has produced a series of works in a variety of mediums, donating one for sale to raise funds for Jelly during Open for Art, and watch performance flash-mobs by Reading Rep hosted at Station Hill. Reading resident Sam Butler, co-artistic director of internationally acclaimed Fevered Sleep will be screening three Fevered Sleep short films, Sheep Pig Goat, It’s The Skin You’re Living In, and Still Life With Dog. Sam Butler is a keen contributor to Reading’s vibrant communities and alongside this screening is working with artists and Battle Primary Academy to develop a newly created West Reading Arts Trail showcasing the very best of west Reading’s creative community. Fevered Sleep believe in meeting people where they are. Over the past 22 years, their work has appeared everywhere from theatres, galleries and cinemas, to parks, beaches and schools, and in the spaces of everyday life: in people’s homes, on phones and online, across the UK and beyond. Other events include silver jubilee themed life drawing at the Jelly artists’ studios at Broad Street Mall, community fabric collage workshops in John Lewis’ haberdashery department and special tree walks across the town; leading you through the beautiful historic streets of Redlands to University gardens, the charming old streets of Tilehurst and Arthur Newbery Park and Forbury Gardens in the town centre. On the weekend of the festival, Friday 6 – Sunday 8 July, you will see the Open for Art team of Art Ambassadors on the streets, identifiable by their festival t-shirts and giant lollipops. They will be on hand to tell you where to find things, how you can get involved and have the festival map available for you to take away for an optional donation of £1. Once again we are being supported by Reading’s Business Improvement District to be able to make this happen.